Federal Reserve chairman Ben Bernanke announced last week that all federally regulated banks will be subject to regulatory scrutiny of compensation practices “to ensure that they do not encourage excessive risk-taking.” Bernanke justified this plan by asserting that “flawed compensation practices at financial institutions” helped cause the financial crisis. It would be an understatement to say that this assertion has not been proven. Bernanke’s heavily footnoted speech provides dozens of statements from various regulatory bodies that simply assert the Bernanke thesis as if it were self-evidently true. The real scandal of bankers’ pay contributing to the financial crisis is that nobody, literally nobody, has offered a shred of evidence that it did contribute to the crisis. Yet public opinion, the financial press, and the regulators have decided that it did, and drastic new regulatory policies are being constructed on that basis. Moreover, when we consult what evidence is known, it seems that bankers, far from deliberately courting disaster so as to boost their pay, unintentionally took risks that jeopardized their own wealth. We can see some of the results in the huge hits taken by key bank executives, such as Richard Fuld of Lehman Brothers, who lost $1 billion by retaining his Lehman holdings until the bitter end. Sanford Weill of Citigroup lost half that amount. Ohio State economists Rüdiger Fahlenbrach and René Stulz have shown that banks whose CEOs held a lot of their banks’ stock fared worse in the crisis than banks with CEOs who held less stock. The CEOs who held stock in the riskier banks must have been ignorant of the risk, or they would have sold their shares. Ignorance, not a perverse pay structure, also seems to have been at work at Bear Stearns. William D. Cohan’s "House of Cards" suggests that before losing about $900 million in stock when the bank imploded, Bear Stearns CEO James Cayne had no idea that anything was amiss. In fact, he was obsessed with the construction of a huge new headquarters building that would testify to the permanence of Bear Stearns, formerly the upstart of investment banks. It isn’t plausible that he would have let anything jeopardize this legacy—if he knew about the risk. All the while, two Bear Stearns hedge funds were buying billions of dollars worth of mortgage-backed securities that ended up sinking the parent bank. Did the employees who ran these funds, Ralph Cioffi and Matthew Tannin, understand the risks they were taking? That is part of what’s at issue in their trial for securities fraud. But we already know that they had millions of dollars of their own invested in their hedge funds, and emails between them suggest that until nearly the end, they felt secure in the knowledge that the funds’ holdings were rated AAA. Indeed, 93 percent of the mortgage-backed securities purchased by banks either were rated AAA or—better yet—were insured by Fannie Mae or Freddie Mac, with implicit federal guarantees. It turned out to be a mistake to trust the AAA ratings, but in making this mistake, bankers again demonstrated that they were not seeking short-term profits to boost their annual bonuses. Had that been the bankers’ aim, they would not have bought AAA-rated mortgage-backed bonds, which, being “safe,” paid a lower interest rate than AA- and lower-rated bonds. Bankers who were indifferent to risk because they were seeking higher return should have bought the more-lucrative, riskier bonds, but they did so only 7 percent of the time. The theory that the financial crisis was caused by pay incentives that encouraged risk-taking simply does not fit the facts. Moreover, if we ask why bankers invested so heavily in mortgage-backed bonds instead of other securities, the answer seems to be a previous regulatory attempt to steer banks away from risk. In 2001, the Fed, the FDIC, the Comptroller of the Currency, and the Office of Thrift Supervision promulgated the Recourse Rule, which encouraged commercial banks to trade individual mortgages, which the regulators deemed risky, for mortgage-backed securities, which the regulators deemed safe—as long as they were guaranteed by Fannie or Freddie, or were rated AA or AAA. The bankers’ repudiation of the higher-yielding AA bonds shows that they were not deliberately courting risk. But the regulators’ judgment about the risklessness of AAA mortgage-backed bonds proved to be disastrously wrong—and this judgment, in the form of the Recourse Rule, made those bonds much more profitable for banks than they otherwise would have been. As a result, banks ended up buying about half of the world’s entire supply of mortgage-backed securities, and when housing prices began to drop, the uncertain value of these securities caused the financial panic of September 2008. 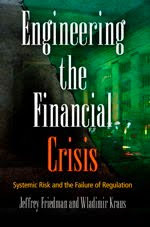 One lesson of the financial crisis, then, is that regulators, like bankers, are human. Nobody can flawlessly predict the future, but regulators—like bankers and other businesspeople—have no choice but to try. There is a difference, however. Competing businesses may pursue a variety of strategies based on divergent risk/reward assessments. Citigroup jumped into mortgage-backed bonds with both feet, even opening its own securitizing unit to transform mortgages into mortgage-backed securities. J. P. Morgan thought the risk was too great and went in the opposite direction, even though that meant passing up the extra rewards offered by the Recourse Rule. Such heterogeneous behavior is perhaps the one saving grace of capitalism. By behaving heterogeneously in order to compete with each other, capitalists spread society’s bets among a variety of ideas about the location of risk and reward. Capitalists as a group aren’t smarter or better at predicting the future than regulators are, and when capitalists fall victim to the herd mentality, they may homogeneously converge on a mistaken prediction. This is a danger, but regulations aggravate it. Of necessity, a regulation homogenizes capitalists’ behavior. Prudential bank regulation, for instance, imposes one idea about risk on the whole banking system, skewing the various risk/reward calculations of all bankers in a direction the regulators deem safe. If the regulators turn out to be mistaken, as they were in 2001, they put the whole system at risk. The Bernanke plan is intended to reduce the risk taken by banks, but by homogenizing all banks’ compensation practices, it may actually aggravate systemic risk. To take such an action with no evidentiary basis flies in the face of reason. No doubt, there are quite a number of economists, not to mention non-economists, that would nod at least in partial agreement with the above. As a result of the crisis, such views have manifested themselves in numerous critical articles in the press and in a chorus of critical voices (including the English queen!) demanding that standard textbooks in economics should be re-written. Also, a number of economists have triumphantly declared ‘I told you so, Keynes is right after all!’ But isn’t the latter just a foreseeable reaction by those whose papers were previously rejected by editors of top economic journals and whose proposals were largely ignored by policy makers? Loosely interpreted this seems more or less what Cochrane says in his response to Krugman’s critique. So, has Cochrane a valid point in saying that Krugman has misled New York Times readers with his outdated Keynesian insights? I believe this is a question of considerable interest both among economists and the general public and have tried to address it based on my experience as an empirical econometrician over a period over roughly 25 years. Let me say it right from the beginning: when we let the data speak freely (in the sense of not constraining the data according to one’s economic prior without first testing such restrictions) they mostly tell a very different story than the one found in standard textbooks. No doubt, our fast changing reality is infinitely more rich and complicated than the models which are discussed there. This does not necessarily mean that these models are irrelevant; it only means that abstract theory models and the empirical reality are two very different entities. Therefore, it did not come as a big surprise that very few observers came close to predicting the scale of the global financial and economics crisis that erupted in August 2007, and that those who did predict a massive correction in financial markets, with the associated impact on the real economy, typically relied on anecdotal evidence and rule-of-thumb indicators that are far less sophisticated than the models employed by central banks and leading academics (Colander et al. 2009). 2. Financial markets pricing behaviour is influenced by fundamentals in the real economy, but it does not change the fundamentals. While most rational expectations models are implicitly or explicitly based on the above assumptions, empirical evidence (when letting data speak freely) suggest that financial markets drive prices away from fundamentals for extended periods of time with strong effect on the real economy. This is what George Soros has named reflexivity between the financial and real sector of the economy. Since it undermines the idea of unregulated financial markets as a guarantee for efficient capital allocation, reflexivity is an important feature of free financial markets that need to be included in our economic models. Could empirical analysis have signalled the looming crisis? Already many years before the bubble burst, the relative house-consumption price index exhibited very pronounced nonstationary behaviour. Such movements of house prices away from ordinary consumer prices was (primarily) facilitated by low price inflation and interest rates. Prior to the bursting of the bubble, the house – consumption price ratio increased almost exponentially signalling that house prices were moving far away from their sustainable level, given by the level of inflation and interest rates. This, in my view, would have been the absolutely last moment for the authorities to react to prevent the subsequent disaster. But, the empirical result that the extraordinary high level of house prices were sustainable only by the extraordinary low levels of nominal interest rates and inflation rates should have been a reason for concern much earlier. Has beauty been mistaken for truth? Assume for a moment that economists would agree that a minimum requirement for a theory model to be called empirically relevant is that it would be able to explain basic empirical facts as formulated in terms of the pulling and pushing forces estimated from a correctly specified and adequately structured VAR model. In such a case I would not hesitate to answer the above question in the affirmative. Economic data, when allowed to speak freely, often tell a very different story than being told by most Walrasian type of models. If anything, the stories data tell have much more a flavour of Keynesianism (though not New Keynesianism!) than Neoclassicism (or other recent isms). But when this is said, I doubt whether it is a good idea to ask which school is right and which is wrong. In some periods, one school seems more relevant, in other periods, it is another one. Quite often data suggest mechanisms which do not fit into any school. But, I am convinced that relying on beautiful but grossly oversimplified models as a description of our economic reality may easily prevent us from seeing what we really need to see. For example, I believe information about looming crisis was there in sufficiently good time to have helped us see the coming disaster, had we chosen to look carefully. To conclude: I believe many economists were indeed blinded by the beauty of their theory models and in my view Krugman was right to point this out to the readers of NY Times.